My own recipe which I conjured up about 1984 for a family Christmas Party. It has continued to be a family favorite. Once I had children, this was their requested meal for Christmas Eve. We ate it as we decorated gingerbread houses. Pour juice from clams over vegetables. Add enough water to barely cover and simmer until barely tender. In meantime, in a separate sauce pan over medium heat, melt butter in a saucepan. Add flour and stir until completely mixed. Add the half and half and stir with a wire whip. Cook over low heat until thick. Add the vinegar, sugar, salt, pepper, thyme and nutmeg. Add vegetables (don't drain off the water) and the clams. Add more salt and pepper to taste. 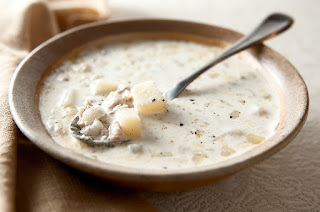 Top each serving of chowder with the crumbled bacon and grated cheese.